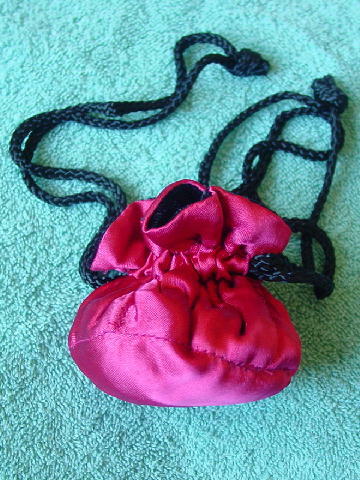 This pinkish-red synthetic (probably a triacetate) pouch has a very well-padded bottom. 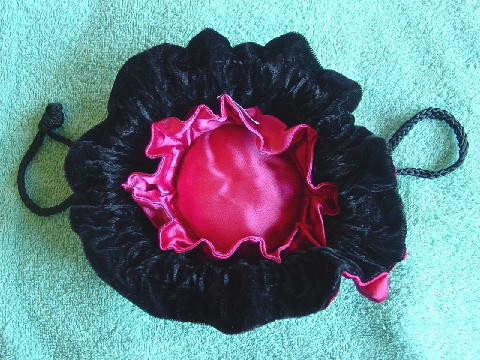 It has long black (11" on each side) cord drawstrings, and the interior has black velvet with red fabric on the bottom and extending 1 3/4" upward. It can be used as a cute little evening bag - it can hold a small lipstick, house key, and money, or you can put your really nice jewelry in it. Or, you can leave it open on your dresser to hold your everyday jewelry.